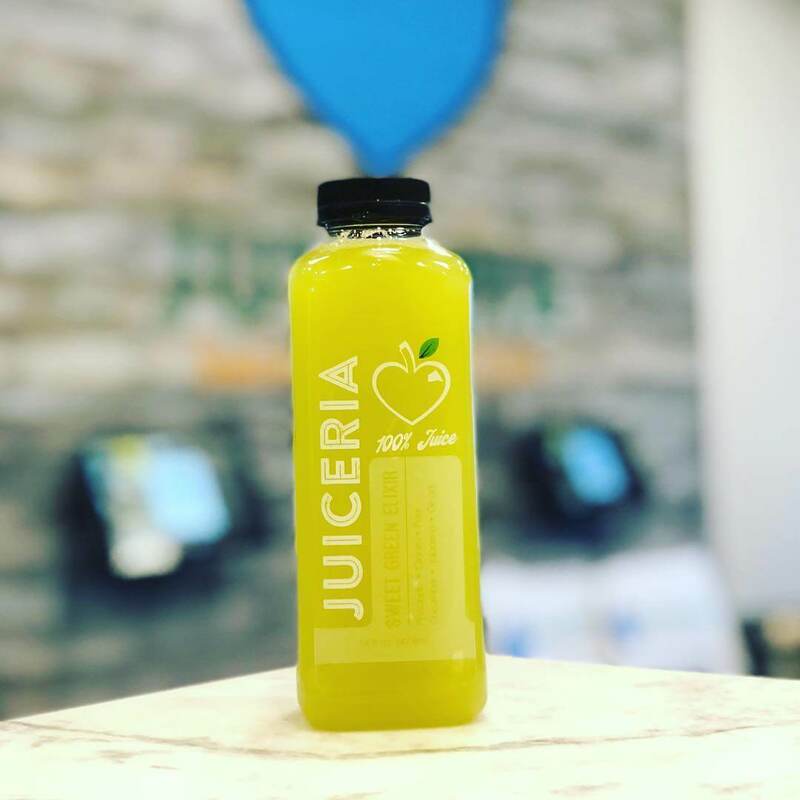 Fresh, fun, flavorful, and full of nutrients – try any item on the Juiceria menu and you will taste the difference! 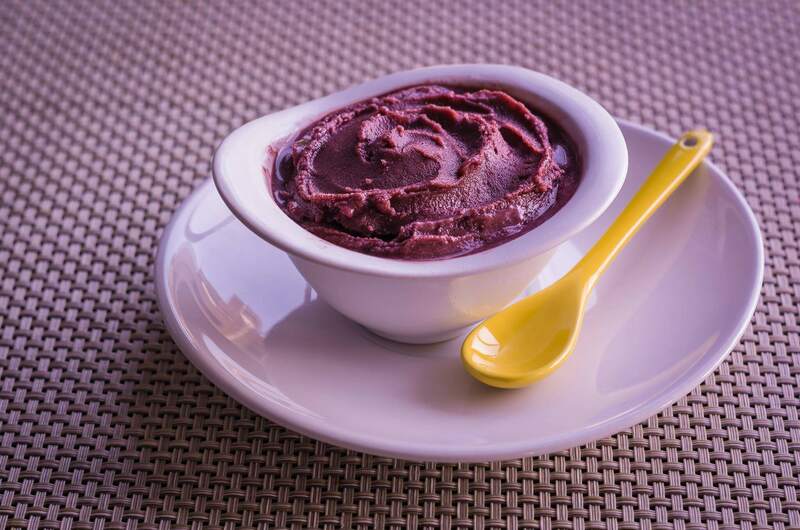 We source our produce from local vendors and prepare orders as they are made. You’ll taste the extra time and care we put into using the best ingredients and methods to make your menu items. After all, you put extra time and care into your health. You value high-quality ingredients and your time. 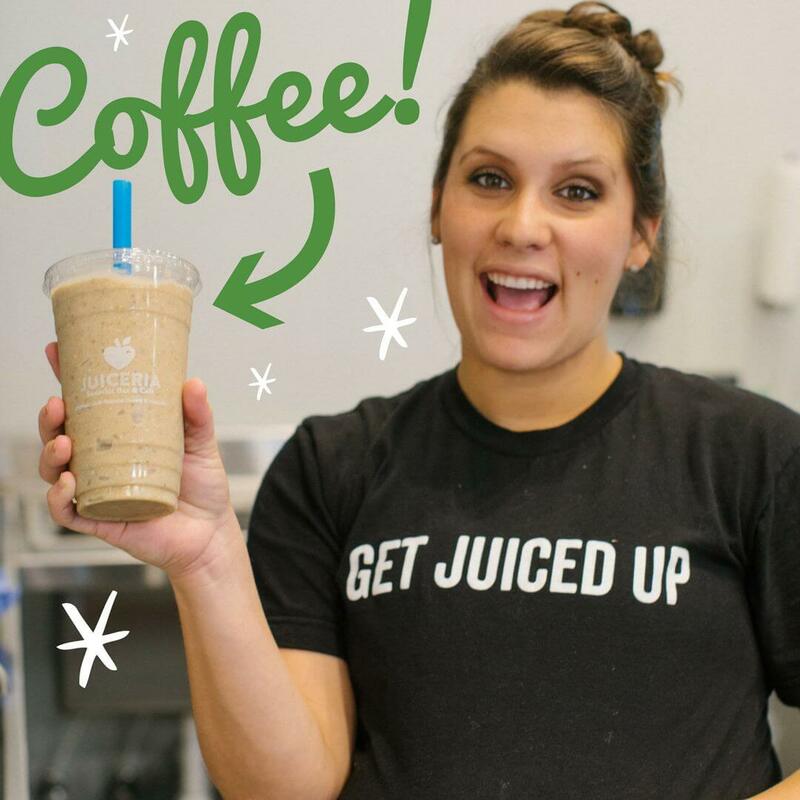 Grab a smoothie or cold-pressed juice full of essential nutrients, and get back to your day. 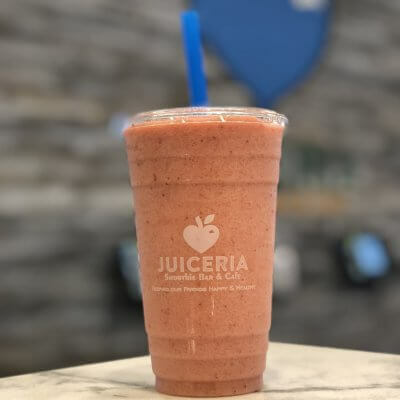 You haven’t had a smoothie until you’ve had a Juiceria smoothie! 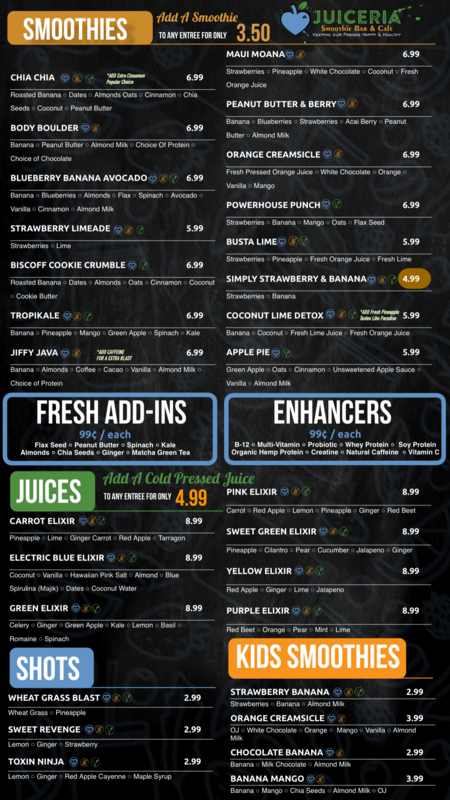 Check out the Juiceria menu and you’ll realize we are different. 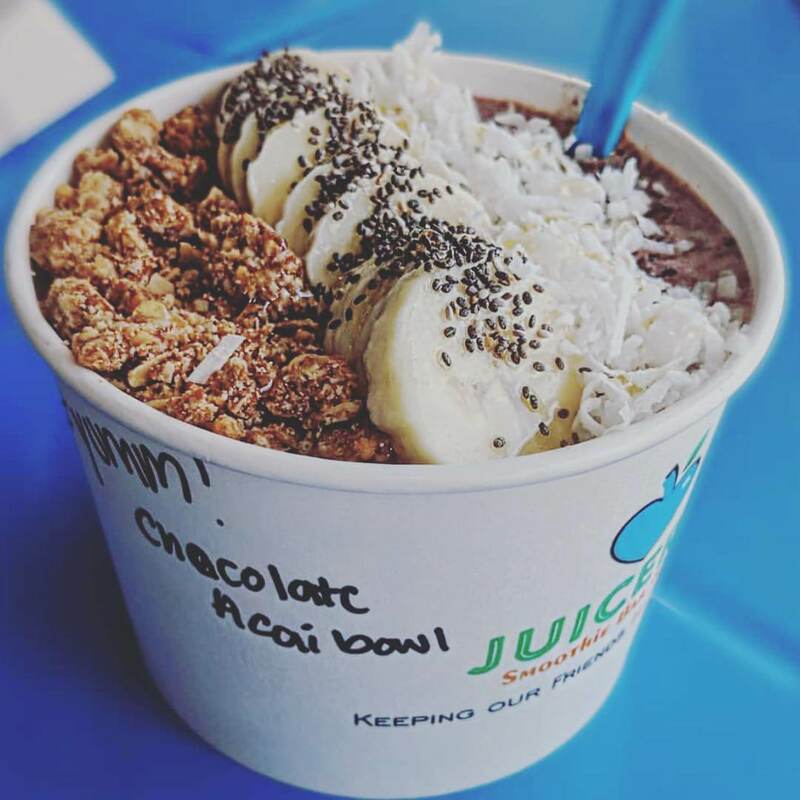 We use fruit and ice as the base of our recipes, adding in complementary ingredients to create an incredible tasting smoothie. 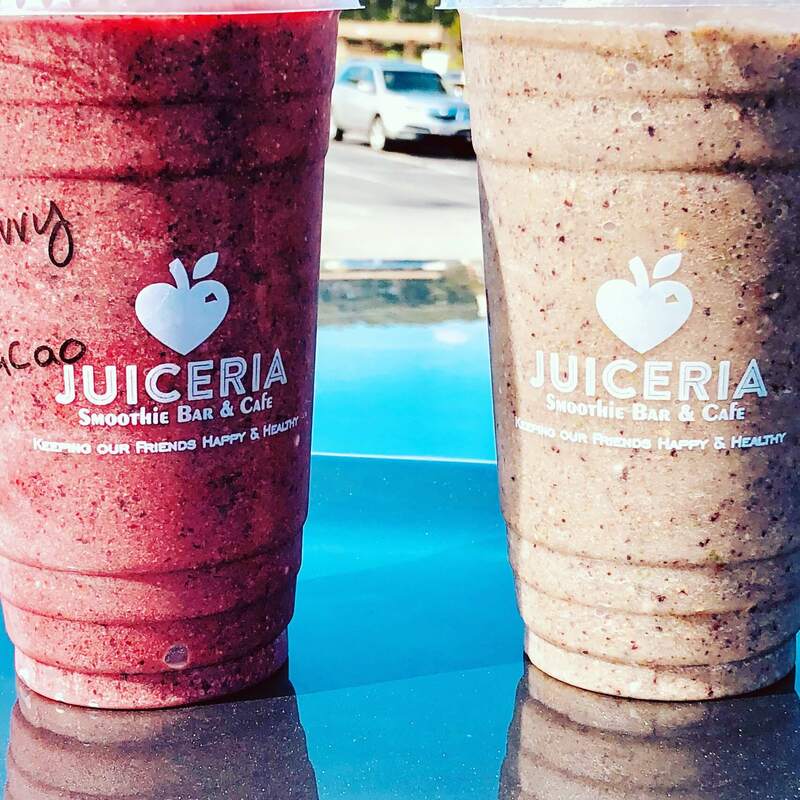 We keep our smoothies simple and fresh. And you can taste the difference. What’s the hype with our signature two-step cold-pressed juices? 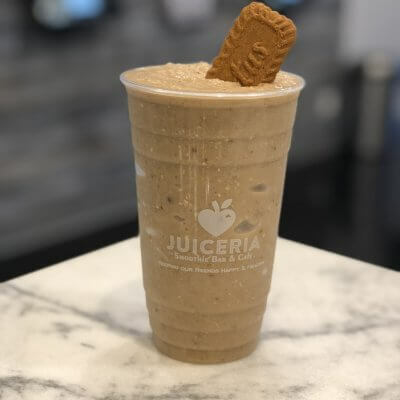 Try an elixir from Juiceria Smoothie Bar & Café and discover the difference yourself! 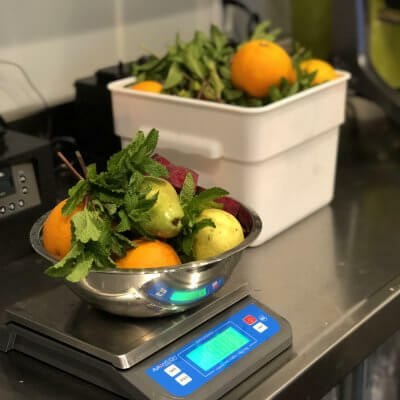 Using a patented two-step cold press to extract delicious, flavorful, and nutrient-laden juice from fresh produce, the cold-press method helps preserve more nutrients and vitamins than other method. 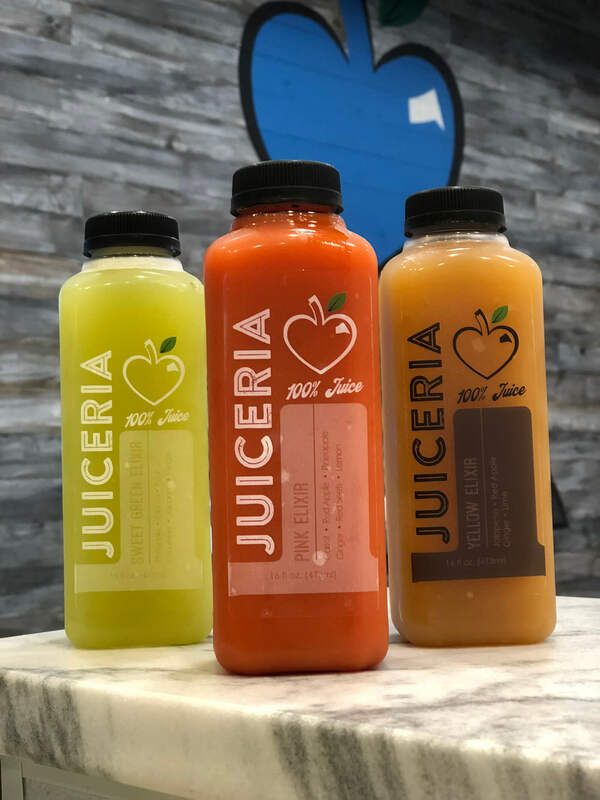 Not only do the juices taste better, they are a healthier, nutrient packed alternative to any other bottled beverage of choice. 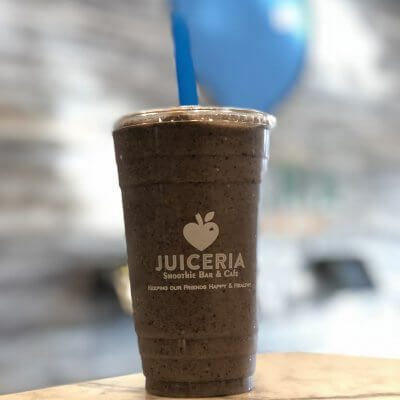 We’ve taken our carefully prepared juices and selected the best tasting recipes for our menu for an optimal kick of flavor, pack of nutrients, and vibrant color! We understand how busy your schedule can be. Why settle for greasy fast food? 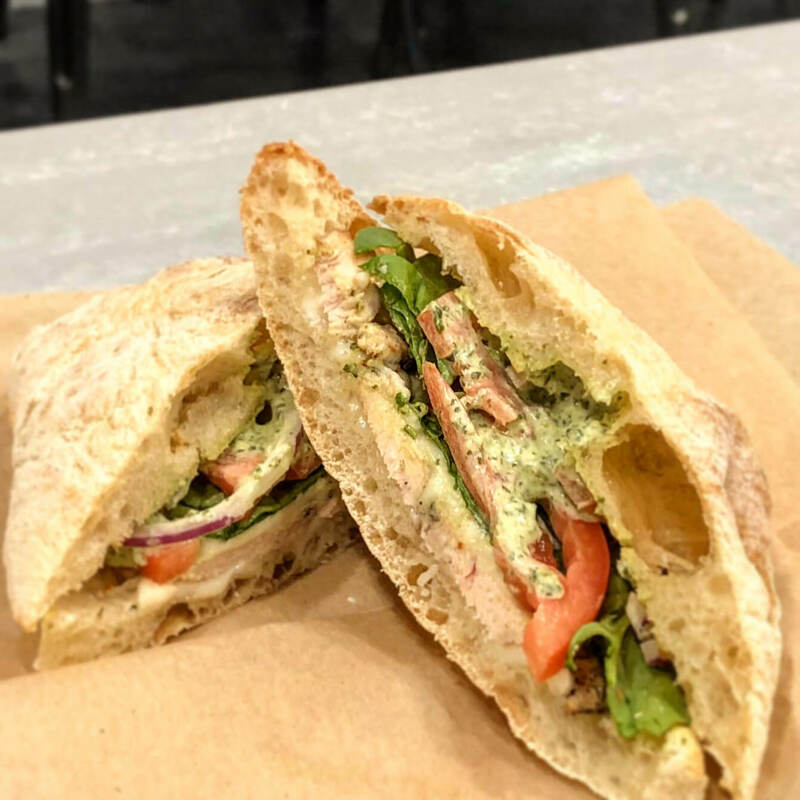 You can get healthy food, fast with our online ordering option! 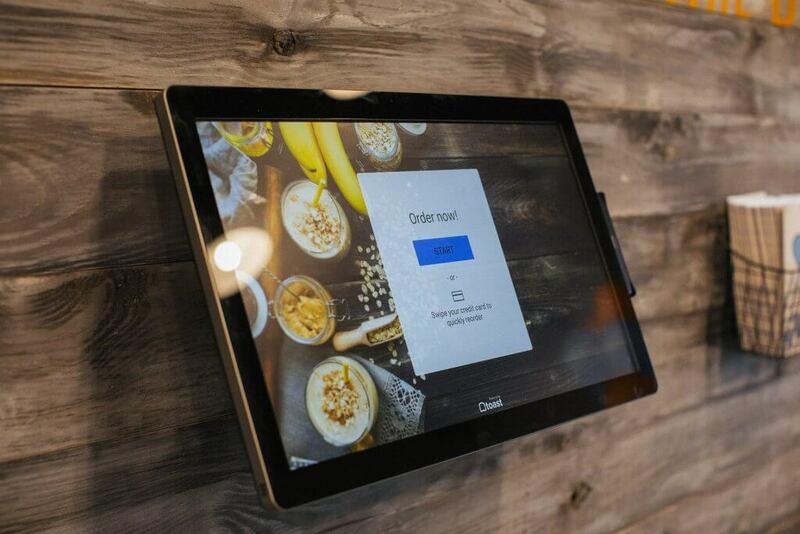 Pick up your order and be on the go just as quick. 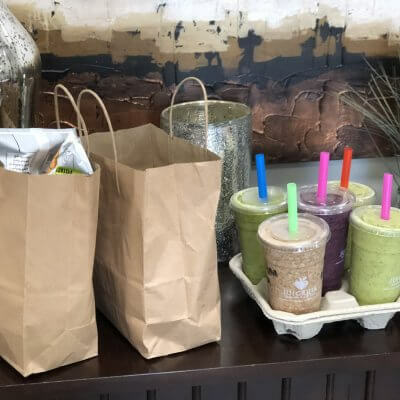 We still put every second of fresh preparation and care into your order, so you can enjoy the benefits of fresh food, even on the go. From breakfast to lunch, kids to adults, we have options for every meal and member of your crew. Come by for a bacon, egg & cheese croissant and cold-pressed juice for breakfast and be fueled up to tackle your day. Enjoy a honey sriracha chicken wrap for lunch. Even our youngest patrons can delight in the options from our kid food and kid smoothie menus. 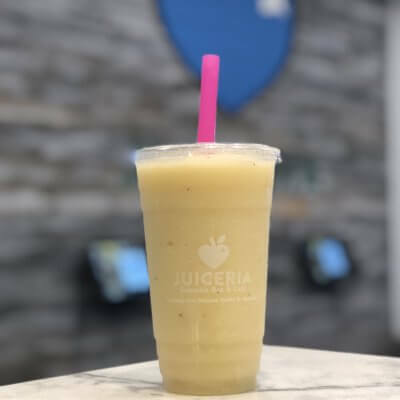 It’s clear that Juiceria Smoothie Bar & Café has everything you need to satisfy your cravings for healthful and delicious meals. 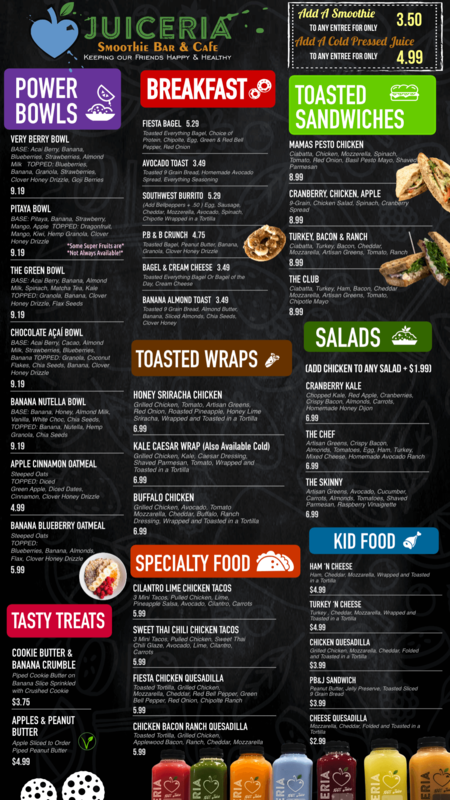 Check out the Juiceria menu and try not to drool as you look at our delicious options. The only question is, why are you still reading? Go ahead and order already!